Beginning a much-anticipated, sold-out concert with three solo, acoustic songs could cause an audience to either grow restless, irritated, or bored. 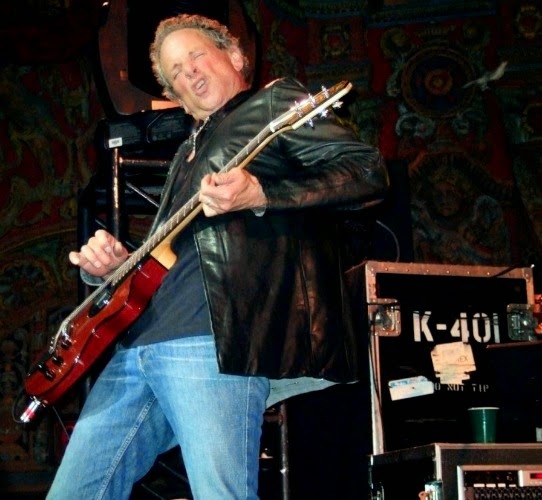 However, when Lindsey Buckingham took the Tampa Theatre stage on Wednesday night, there seemed a collective concentration throughout the crowd, with everyone intent on listening to the music legend finger-picking his guitar and singing songs from his solo catalog as well as from his tenure with Fleetwood Mac. Buckingham is on the road promoting his latest solo album, Under The Skin, a set of songs that sound far more sparse and intimate than the polished productions of his prior solo works and Mac compositions. Tracks like “Not Too Late,” which started the show, and “It Was You,” mirrored the album arrangements, while still yielding inspired live performances. Some of his older cuts also received more subtle treatment during the concert, remarkably so on his 1981 hit, “Trouble,” which sounded more immediate and edgier than its original pop-radio-friendly version. Even after his more-than-capable band joined in, accordingly filling out the sound, Buckingham nonetheless stood out as a towering singular talent. Buckingham’s virtuosity on the guitar never seemed so evident as during his performance of “I’m So Afraid,” from the Fleetwood Mac album, the first record with him and (then-girlfriend) Stevie Nicks in the fray. In last night’s live setting, within the ethereal architecture of the Tampa Theatre, the song (and most notably, Buckingham’s searing guitar solo) ascended toward a mesmeric climax. “Holiday Road,” the bouncy theme from the film, National Lampoon’s Vacation (and, arguably, Buckingham’s most recognizable solo song), began the encore. Then, as if returning in tone to how the show serenely began, additional selections from Under The Skin, including “Show You How” and “Shut Us Down,” softly brought a night of incredible music to a close.